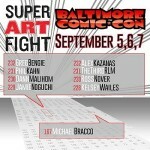 I will be at Baltimore Comic Con this weekend in the Super Art Fight block! Come visit me and get some super kawaii prints and drawings. Table 228!